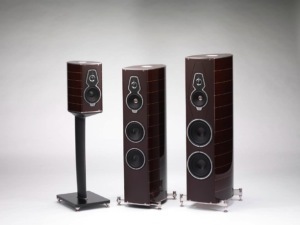 Sonus faber wishes to evoke Italian design and creativity at their best by restyling the Homage collection, the company’s most iconic line which has been completely revamped in keeping with its rich past and precious legacy. Welcome Homage Tradition! The collection features four elements: Amati, Guarneri, Vox and the newcomer Serafino, a 3,5 ways floor-standing speaker, whose name is taken from the history of Italian violin-making (Santo Serafino – 1699 /1758 – Venetian master trained at Nicolò Amati workshop). The made-in-Italy appeal and the great Sonus faber tradition find their expression in a classic and slightly retro approach, where the classical lute shape is still central and maintains the roots with the history but components, finishes and design has been completely renewed.